January 17, 2018: Greetings! Rudy would like to thank present and former students, dancers, and collaborators for their support and artistic contributions since his arrival from New York in 1978. Rudy continues his workshop, Structural Moves, every Sunday from 11AM - 1PM at West Side Academy of Ballet, Santa Monica. Open to those interested in taking their dance, or non-dance, experiences into new paths. Studio fee $5. Also this month is the 50th Anniversary of Rudy’s first concert with Barbara Roan and Anthony LaGiglia at Judson Memorial Church, January 8th & 9th, 1968. The evenings included Rudy’s early solos, which were performed by Anthony and Barbara, as well as new work. At the time, Marion Sawyer of the Chelsea Clinton News wrote: “It is a marvel that this amazingly coherent art came out of the discontinuities of the 60’s.” And it’s a marvel that dance continues to flourish here in Los Angeles…. December 15, 2017: Prelude to the New Year..."I was intrigued by a concert of Rudy Perez’s works presented by Judson Dance Theatre. He makes dances like primary structures. In fact, his whole approach to dance has sculptural, even painterly facets. His pieces are short, stark, pristine – conveyed in strong, clear strokes and unshaded colors. He appears preoccupied with the element of design in dance, more than in, say, rhythm." Read the entire 1968 Deborah Jowett review. A documentary on Rudy Perez premiered at MOCA Museum of Contemporary of Art in Los Angeles on November 21, 2004. The documentary features Victor Quijada of Rubberbandance Group in a reconstruction of Rudy’s seminal 1963 solo, Countdown. Includes commentary from critics, interviews with past and present dancers, comments by the Producer Severo Perez, and segments from Rudy’s repertoire. The screening concluded with a Q & A by Victoria Looseleaf, and was produced with support by Latino Public Broadcasting. The documentary is available for purchase. Rudy was at the Martha Graham School in 1955 and was part of her special class for demonstrations whenever she had dignitaries and other guests, e.g. Mary Wigman, and Helen Keller. In fact, Rudy’s solo Countdown (1966) was influenced by Martha's Lamentation. Premiered at the Mary Anthony Studio, Countdown was originally titled To Mary With Love. The Martha Graham Company recently performed at Valley Performing Arts Center at California State University, Northridge - May 13, 2017. Artistic Director Janet Eilber is to be commended for her commitment and dedication to Martha's legacy. Many of us are forever grateful. Did you know that two women performed Rudy Perez’s 1962 Countdown ? They were Ze’eva Cohen in the 1970’s in New York, and Bonnie Oda Homsey in the 1980’s in Los Angeles. Mary Anthony’s studio in New York, and was originally titled To Mary With Love . It later premiered at Judson DanceTheater. In the mid-seventies, Countdown was in the repertoire of the Alvin Ailey American Dance Theatre and was performed by Clive Thompson and ﻿Dudley Williams﻿ along another famous Perez solo, Coverage . 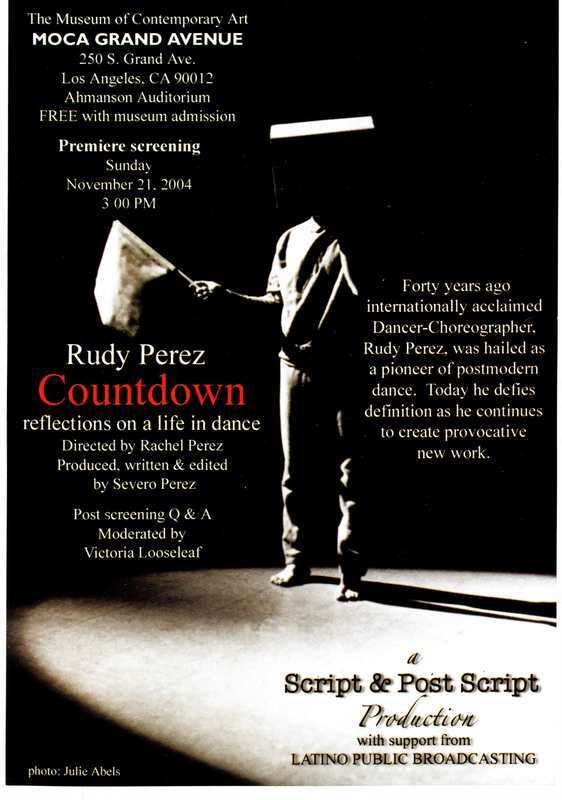 Countdown was seen most recently in the documentary, Reflections on a Life in Dance by Rachel and Severo Perez (no relation), and was performed by Victor Quijada of RUBBERBANDance Group.